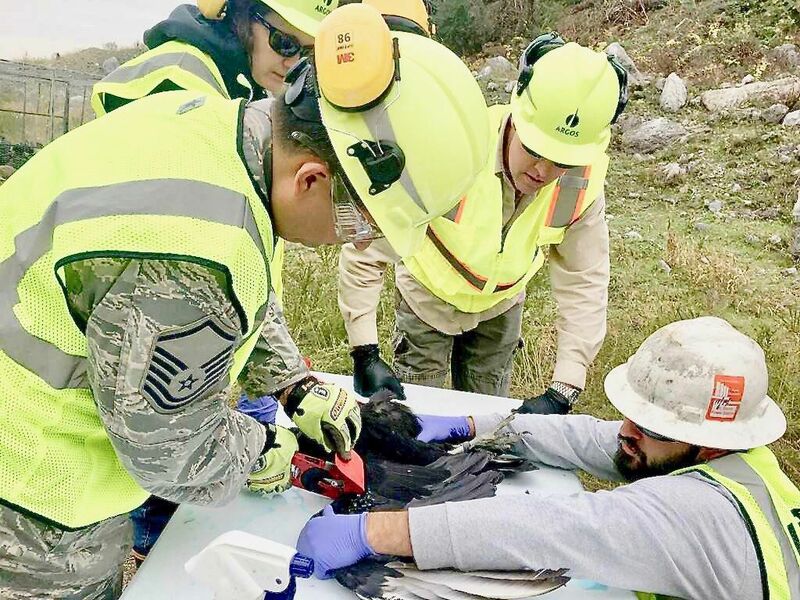 MARTINSBURG, West Virginia — Officials are seeking the public’s assistance to spot vultures that could endanger aircraft at the 167th Airlift Wing of the West Virginia Air National Guard. About 50 black vultures that roost nearby at the Argos Cement Plant on Queen Street have been fitted with red tags bearing alphanumeric codes on their right wings, according to a news release from the Air National Guard. The tags help track the birds and provide research about how they move and interact with the local environment. “They do have their spot in the ecosystem — cleaning up dead animals and roadkill,” said Chad Neil, a wildlife specialist for U.S. Department of Agriculture Animal Plant Health Inspection Service Wildlife Service-West Virginia. Birds can hit the windshield of aircraft or get sucked into engines, which could cause a plane to crash. Black vultures are a protected migratory bird that usually nest in dark cavities and feed on dead animals. They tend to soar in flocks to spot their food and roost together in trees or transmission towers. The birds can be considered a nuisance in populated areas. Black vultures often can be seen soaring around the tower at Argos, which is less than 2 miles from the end of the runway at Eastern West Virginia Regional Airport. Black vultures are most common in Central America and the southeastern United States, but have extended their range beyond the mid-Atlantic region in the last several decades. Sightings of the tagged vultures can be reported to vulture.tag@gmail.com. People are asked to include the location of the sighting, a tag number if visible and any behavioral information. The birds should not be handled in an attempt to see their tag codes. The study is being conducted by Argos, the West Virginia Air National Guard, and the United States Department of Agriculture.